As August ends and markets hold their collective breath about what decisions will be made at Jackson Hole, I wanted to see if I could debunk the commonly held notion that we'd be in for more QE3 later this Friday. I have noted in several posts that I think Bernanke will announce that interest rates will continue to remain low through 2015 and not just 2014 as he previously disclosed. The hope is that another year of low interest rates will continue to underpin the housing market's "recovery" and of course ZIRP will force Mom and Pop and Grandma and Gramps out of their savings accounts into riskier assets. Unfortunately, I think the market is really looking for more out of the great academic than just constant rate twisting and therefore we may actually see the markets correct a bit here as banks and traders need another boost from the central bank to push the indices higher. There is only one problem with the conventional notion that we'll get more of the stimulus that we need, it is simply that real food and gas prices have been increasing significantly even though the Fed's own inflation measures remain in check. What types things are going higher in price? We need to look no further than food commodities to see some dramatic prices increases. July 2012 was frankly the hottest July on record in the USA. 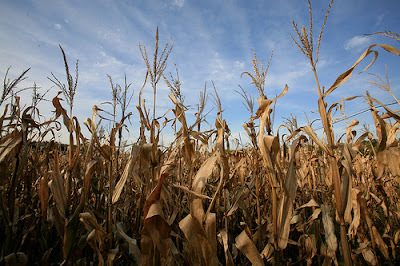 In addition to the heat, the midwest also suffered a severe drought that has really destroyed corn and soybean crops. As a result of impaired crop growth, prices for have farm products have increased. Soybeans and Corn have not only moved higher, they have exploded to near record highs. Rice is one of the lone exceptions to have not vaulted into record territory. The point in putting these charts of the "softs" is that Bernanke may just have put himself in a box with the help of these weather conditions. If he were to implement a fresh round of QE3, 4, 5, or something here, we can be sure to see these food inputs go even further above their ranges and records and also we'd see gasoline blow sky-high. I noted earlier this summer that gasoline has actually done a Crazy-Ivan and actually gone up in July which is HIGHLY unusual. Bernanke can't push gas prices and food input prices much higher without really slamming on the brakes of our economic recovery. UGA has broken out and now could be headed to test its 2008 high near $67 (currently at $58.50). (Not charted here). "6) AG STUFF -Yes, I said it again, corn, wheat, soybeans, sugar and anything that can be consumed will move much higher. A safe play is to time the exit in May as well, but I think that agricultural commodities will be the one uncorrelated asset this year that just kills it. The more intervention we see domestically by Uncle Ben and his round table of doves we will see more food disruption in the form of out of control prices fed into the system. Tunisia, Egypt, Libya, and Syria will all just be the tip of the iceberg as world citizens rise up to confront their leadership's ability to control prices of food as a result of the never-ending liquidity spigot originating in the USA. Names to watch here are CORN, JJG, SGG." One I do own now and have had since earlier this year, but didn't mention in the piece is DBA, the Powershares Ag Commodity Trust. I've had a decent 8% gain since obtaining it, but I feel that there is going to be more in this trade coming from macro-factors. WHAT COULD TEMPER THE BULLISHNESS? While US farmers and agribusiness producers are having a terrible time this summer, Brazil has jumped into a significant leadership roll. Brazil is now the world's largest soybean producer and also had their best corn crop ever. Brazil's role in global food production and exportation has never been so large and important. All the bullishness for agribusiness commodities could dampen if Brazil posts larger than expected production or if the US farmers could actually save some of their crops. Ultimately, if Bernanke doesn't move to fire up some form of QE as a result of fear of overheating commodity prices or concerns about retaining fire-power as the Euro situation continues to deteriorate, these commodities like corn, wheat, or soybeans could shock the markets and fall significantly.